Rock The Body Electric: Dylan Cover #178 Tedeschi Trucks Band "Don't Think Twice, It's Alright"
Dylan Cover #178 Tedeschi Trucks Band "Don't Think Twice, It's Alright"
In this ongoing Monday Series we will be exploring various artists versions of Bob Dylan song's. 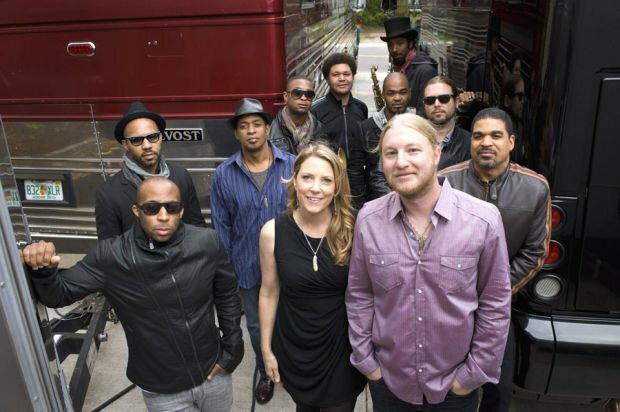 Today's tune comes from the Tedeschi Trucks Band with Amy Ray and is a live cover of "Don't Think Twice, It's Alright"
Every time we hear The Tedeschi Trucks Band we enjoy it. There is little to disk like about the couple headlining and their back up players are all top notch. That said we have never had the urge to see them on their own yet (although if their 2015 tour came closer we would go) and their albums always seem to go on a bit too long (both in individual songs and total time) for us. We are happy they are making glorious music though and here's hoping the band stays together. Wow, this tune just keeps delivering with great live covers. This song starts out fine with Susan singing over acoustic wanderings, Amy Ray from The Indigo Girls continues it, but when that lonesome trumpet comes in, boosh! That is the jelly. Granted like a lot of jam bands these peeps over do it a bit because I could do with out the showy flute solo, but damn this was a fun listen for that trumpet break alone. The gorgeous singing from both Ray and Tedeschi is great as well and shouldn't be undersold.